The most common treatment options for women with endometrial cancer are chemotherapy, radiation therapy, hormone therapy, and surgery. A woman may also be recommended to undergo several types of treatment in combination for the best results in healing and recovery. If a tumor has developed in the muscular layer of the uterus. If a tumor has spread to tissues outside of the uterus. If a tumor has spread to other parts of the body. A woman’s age and general health. In many cases, a woman will be referred to a specialist to treat endometrial cancer, such as a gynecologist, gynecologic oncologist, medical oncologist, and/or radiation oncologist. For women who have early stage I endometrial cancer, a hysterectomy may be performed. This procedure will remove ovaries and tubes to completely eradicate all cancerous cells from the uterus. Surgery may also be used with radiation therapy to treat women who have stage I uterine cancer. This type of treatment has a much higher success rate to treat high-risk cancer cases that could spread to the lymph nodes, such as stage 2 or stage 3 endometrial cancer. For more aggressive cases of endometrial cancer, like stage 3 and stage 4, chemotherapy may be recommended. Endometrial cancer is often diagnosed early. For early diagnosis, the one-year survival rate is as high as 92%. For cases of endometrial cancer that have not spread, the five-year survival rate is 95%. If endometrial cancer spreads throughout the body, this five-year survival rate could drop to as low as 23%. Some complications of the disease could include anemia because of excessive vaginal blood loss. It is also possible to experience perforation of the uterus in an endometrial biopsy. Treatment options like chemotherapy, radiation, and a hysterectomy can cause a number of complications and side effects. After treatment is completed, a woman will need regular checkups every 3 to 6 months to ensure that the cancer does not return. A woman should also contact her doctor immediately if she experiences vaginal bleeding, a bloated abdomen, pain in the abdomen, shortness of breath, or sudden weight loss any time after cancer treatment. It is important for women to undergo regular pelvic exams with their gynecologist as soon as they are sexually active or at the age of 21, if they are not yet sexually active. This will help to constantly track the health of the reproductive organs and detect any abnormalities early on. Women are recommended to have Pap smears three years after becoming sexually active. Women that have a high risk of endometrial cancer should be monitored even more closely by their doctors. This includes regular screening tests and pelvic exams, as well as periodic endometrial biopsies. Women who are taking estrogen replacement therapy also need to be closely monitored with frequent Pap smears and pelvic exams. 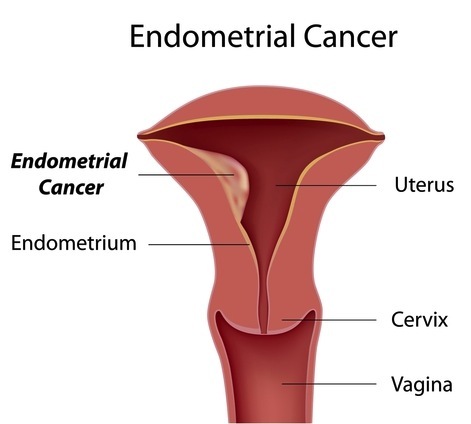 Source: "Endometrial cancer - PubMed Health." National Center for Biotechnology Information. N.p., n.d. Web. 10 Oct. 2011.